Chess Explained books provide an understanding of an opening and the middlegames to which it leads, enabling you to find the right moves and plans in your own games. It is as if you were sitting at the board with a chess coach answering your questions about the plans for both sides, the ideas behind particular moves, and what specific knowledge you need to have. 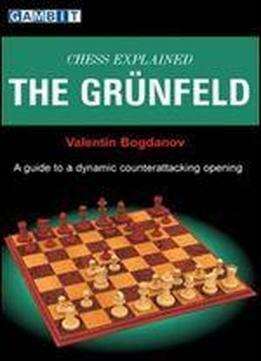 The Grnfeld Defence is one of the most aggressive openings at Black's disposal. He creates immediate imbalance and plans to strike at White's centre with all available resources. An insipid response from White may not even retain equality, so in the main lines he takes up the gauntlet: he creates a large pawn-centre and puts this to use to launch an attack. While the theory of these lines has been extensively developed, there is a coherent logical thread running through them: the Grnfeld is essentially an opening of grand ideas, which need to be understood well in order to get to grips with the theory and handle the resulting positions. This book provides a discussion of all major lines, and a special contribution from Viacheslav Eingorn on the key ideas of the Rb1 Exchange main line, which he was instrumental in developing in the 1970s and 1980s.